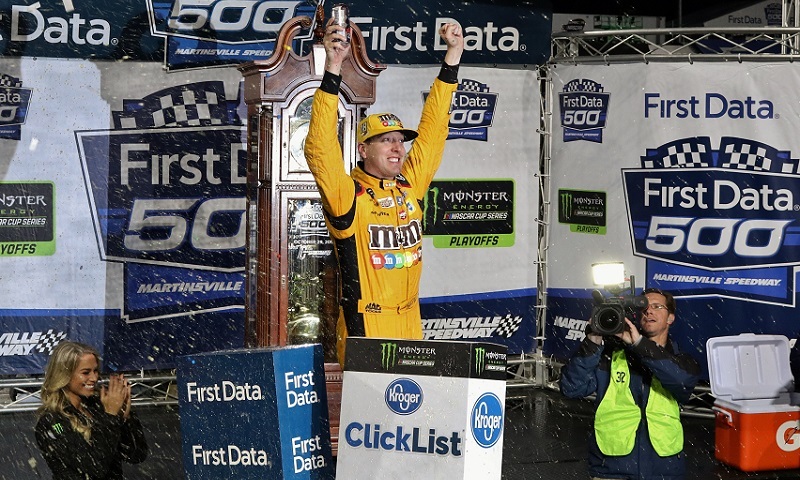 MARTINSVILLE, Va. — Kyle Busch openly admitted Sunday night at Martinsville Speedway that his car wasn’t the fastest in the field. In fact, it was Chase Elliott who appeared to have victory in his grasp going down the stretch run to the finish. But what appeared to be Elliott’s race to win Sunday night at Martinsville Speedway devolved into a twisted, steaming mess of unmitigated chaos in the final laps. And ultimately, it was Busch who survived a knock-down, drag-out slugfest in the First Data 500, punching his ticket to the Championship 4 by way of a thrilling last-lap pass for the victory. Elliott was the unrivaled favorite as the final third of the race wore on and the lights came to life at the Virginia half-mile, powering inside of then-leader Brad Keselowski in turns three and four with 115 laps left and opening up a commanding margin at several points during the closing stages. In fact, Elliott led 84 laps as the night wound towards its end, but a spinning Carl Long drew the ninth yellow flag with 43 to go and set up a sequence of events that left fans cheering and tempers bent. Racing resumed with 36 to go and Elliott got a huge launch off the bottom lane, getting away to the lead but not getting away from Keselowski. The 2012 Monster Energy NASCAR Cup Series champion got back to Elliott’s bumper six laps later and gave him a huge shot going into turn one, moving Elliott out of the way and assuming command in his own right. Keselowski then opened up a sizable margin of more than a second as he looked to sweep the season at Martinsville, but contact between Kyle Busch and Joey Logano in the battle for third ultimately led to Logano losing a left rear tire and spinning, sparking another caution and paving the way for a shootout to the finish. While those from 11th on back pitted for tires, Keselowski chose the outside for a four-lap dash and restarted with Elliott alongside. Keselowski hoped that he would be able to use the rubbered-in groove on the top of the track to clear Elliott when the green flag waved, but the end result was anything but what he had planned on. Elliott forced his way through turns one and two to stay alongside Keselowski before shoving him out of the groove going into turn three, taking over the top spot on lap 497 as Denny Hamlin moved into second behind Elliott. When the field got back to the backstretch again, Hamlin sailed into turn three on Elliott’s back bumper as Elliott slowed for the corner, sending Elliott careening up the track and ultimately spinning the second-generation driver into the outside wall as a result. That ended Elliott’s chance for the win, but the madness still wasn’t over. Hamlin restarted as the leader for an overtime attempt, with Busch alongside, but Busch stumbled on the restart and Hamlin got away cleanly for the lead. However, Hamlin got loose entering turn three and Busch was able to get back to his rear quarter-panel, narrowly missing leading at the white flag but being in the cat-bird’s seat going back into turn one. Contact between the two teammates sent Hamlin wide in the center of the corner and allowed Busch to seize the lead, and though Martin Truex Jr. snuck inside Busch in turns three and four, Busch was able to power off the outside and get back to the checkered flag first as everyone from fifth on back crashed behind him.